If you know your current password, but want to change it, follow the steps below. Log on and click the user icon (or your picture) in the top right corner. Select Change Password on the menu. Then type your new password again to confirm it. Click Change Password to save your new password. 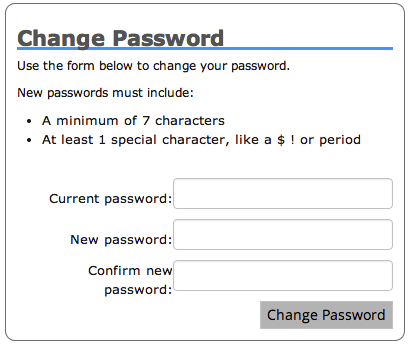 The new password must be at least 7 characters. It must also contain a special character such as a $ or ! or just a period.